Manchester United forward Anthony Martial looks ready to commit his future to the club following contact from managerial candidate Zinedine Zidane. The France international has had a difficult time at Old Trafford, and was out of the squad altogether for the 3-0 defeat against Tottenham on Monday night. Clearly not an ideal fit for current manager Jose Mourinho, it is little surprise that RMC reported later that night that Martial wants out of the club. However, the Times have since reported that the 22-year-old is ready to sign a new long-term contract with the Red Devils as he feels he can out-last Mourinho. 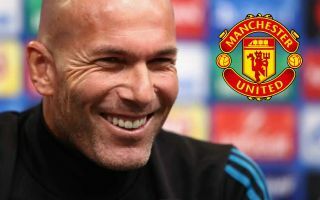 CaughtOffside were recently told by sources close to former Real Madrid manager Zidane that he was confident he could be offered the United job imminently after the team’s poor start to the season under Mourinho. A contact close to the French tactician also informed CaughtOffside that Zidane had spoken to Martial and fellow Frenchman Paul Pogba about staying at the club as he prepares to take over. Despite the Independent claiming Zidane is keen on a bit more of a break from football after stepping down at the Bernabeu at the end of last season, the same source close to the coach has again told CaughtOffside of the 46-year-old’s contact with Martial, stating that the player’s turnaround over his future and decision over a potential new contract is down to Zidane’s personal intervention. CaughtOffside understands Zidane has vowed to make Martial a key part of his squad if he takes over, as he rates the former Monaco starlet highly. Jose Mourinho nearing Manchester United sack? It has widely been felt that a different style of manager could be needed to get the best out of flair players like Martial and Pogba, who have not flourished under the more conservative-minded Mourinho, despite showing glimpses of real potential under other managers and at other clubs. The Portuguese has never really been one for getting attackers to express themselves, as he expects even his forwards to contribute defensively in a solid and well-organised set-up. Given his methods are no longer yielding the success they brought during his days at Porto, Chelsea and Inter Milan, however, it would make sense if a change were now sought by United. Club sources continue to rule out Zidane speculation, and as noted by the Independent, it may be that Tottenham’s Mauricio Pochettino is the favoured candidate to replace Mourinho, though as stated in that piece, the Argentine is a slightly more ambitious target due to being employed by a major rival. Zidane, however, remains out of work since leaving Madrid and word from his entourage seems more positive about the prospects of heading to Old Trafford soon, so much so that he may already be influencing the decisions of key players like Martial behind the scenes. Similarly, Spanish outlet Don Balon have also reported on him already making transfer plans for if he gets the job. United take on Burnley in their next league game and the Daily Mail claim he faces the sack if the team loses again, so it may be that we’ll know a lot more about what’s really going on with Zidane soon enough.